First, Dan Meinwald: he had a Helius Viridia table with their Phaedra tonarm, and a Kiseki Purpleheart “driving” an EAR 324 solid-state phono stage. This went into a Mytek Brooklyn A-to-D, and thence to a pair of EAR tubed 509 amps (top) and a solid-state amp 834T (bottom), driving Dragonfire Acoustics DRC-1 room-corrected speakers — all of which is a lot to type, but the sound was pretty damn perfect for a hotel room. And then he switched to playing files, and I lost it completely. It’s not that it was better, but it was as good, and oh my god, the music — he played a newly released Jaco Pastorius live solo/duet with Toots Thielmanns. Jaco, when he was grounded, when the music kept him focused—well, even though that piece was a showcase for all the familiar tricks I’ve come to expect from him, they’re better tricks than ANYBODY else had, and he invented them. Better than anybody. He really was, as he famously introduced himself to Bobby Colomby at Epic Records more than 40 years ago, “The best bass player in the world”. Anyway, back to the system in Dan’s room— it wasn’t QUITE a megabuck system anymore, even though the speakers are $30,000. I could happily live with them. Speaking of megabuck systems, I did hear a pair of towers from Von Schweikert, the Ultra 11s, which list for $295,000. It wouldn’t be fair to judge from the way I heard them, but I wasn’t engaged. Too big a room, or too crowded (they were certainly impressive to see), or the music just didn’t grab me. On the WAY other end of the price spectrum, I did hear two systems I could recommend, though one isn’t for sale. Wendell Diller, of Magnepan, consistent with his reputation, was “just having fun”. He had a pair of stacked Magnepan .7s per side to create a near enough to floor-to-ceiling line source, with a 1.7 for a derived center-channel speaker, all hidden behind a scrim. And damn if it didn’t work. And, as usual, Magnepan offers one of the great bargains in speaker systems. 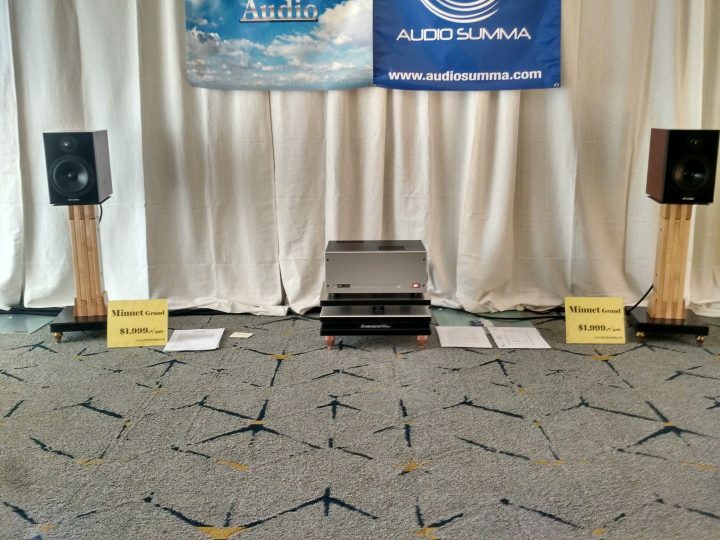 Another incredibly affordable speaker is the comparatively tiny Silverline Minuet Grand at two thousand. I had to ask if there was a hidden woofer. And the amp was of great interest to me: the resurrected BEL 1001. I’ve had a pair of BELs for about 25 years, and have had 25 years of flawless performance from them. I thought when Richard Brown died, the amps would go with him, but someone has brought them back, and judging from the performance with these little speakers, whoever Sal Zambrano is, he’s nailed the design. [If memory serves, Sal is the dealer—Audio Summa. Silverline is a 20-year-old brand, with speakers designed by Alan Yun.—Ed.] I don’t recall the music, and it was a bit loud, but really impressive. The BEL 1001 and Silverline Minuet Grands. Honorable mention has to be given to Rethm, a company out of India, who showed a sub-$3800 floor-standing speaker with a single wide-band front facing driver and an isobaric subwoofer arrangement. As usual with a wide-band, it was beautifully coherent. And to Emerald Physics, who showed the EP-2.8 open baffle speaker. I only heard it for a minute in a crowded room, but it stood out (as is usual with Emerald Physics). Finally, the room where I had the most fun: Studio Electric. David MacPherson and I are Facebook friends (in which the dialogue is usually political) but we’d never met. We got on “like a house on fire”, and I was in his room way too long, playing mostly reggae and his own recording of the Utah Symphony through his wonderful, larger floor-standing speakers, the FS1. It was particularly nice to run into people who didn’t feel the need to gouge potential customers. The FS1 is a true bargain at $5900 a pair. Now I’m looking in my collection for some Ernest Ranglin and Monty Alexander…. No doubt Jaco is a gifted bass player. A lot of what is played these days and past years depends on the particular tune being played and the group as a whole. I have played bass professionally for many years and I must say there are three bass players that I think no one comes close. Take your pick as to what order; Brian Bromberg, John Patitucci and Marc Johnson. Gil I’m late to the party but a fourth bass player must be added: Stanley Clarke. Heck while I’m at it let me add one more: Christian McBride.